I really need to invest in a proper mannequin after uni, these ones are so good as they have lines already on them for bust point, centre front etc. I'm literally working on a mannequin 24/7 nowadays too, which is really fun but stressful when the mannequins are slightly bigger than the actual model so you need to change all the sizes again! This was an initial line-up idea for my final collection. It has been a lot more refined now and has changed loads, but I still like to look back to this and see what some of my original designs were. My initial ideas came from India and jellyfish, not that you can see that much in these designs either, but everything moves and develops so quickly! 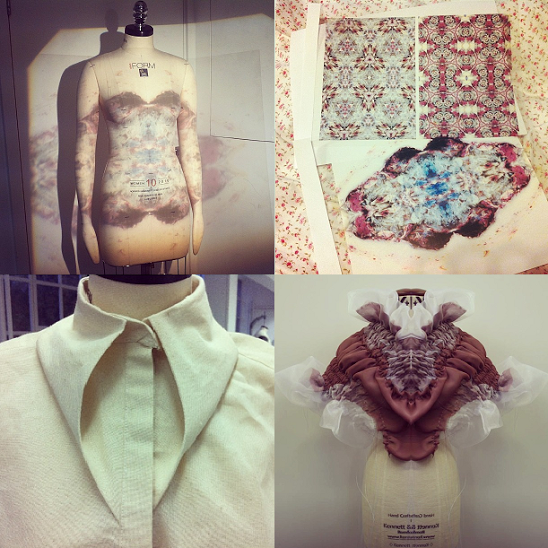 I've had fun this term experimenting with textiles and other ways to design which I hadn't done before. Even just setting up an overhead projector and projecting your chosen image onto a mannequin can inspire some new ideas! Here are some of my initial print ideas, some are more literal and some have been kaleidoscoped (if that's a word) to make them a repeat pattern and a bit more interesting. I'm still not 100% which style I like the best yet, but I do think I should only have one or the other, as the non-repeat one looks a lot more organic. I spent a good few days creating this curved collar but I'm really happy with how it has turned out. I'm going to have a printed version of this shirt somewhere in my collection for definite as I love it, and I need to have some simplistic garments in my collection to balance out the smocking and embroidery. Lastly, I have been experimenting with smocking different materials and draping it onto the stand. I love how this experiment has turned out, and it would look great as a top on it's own, or simply as a neck-piece. I've always loved the look of smocking techniques and the ruffles goes back to my initial research when I was looking at jellyfish tentacles. I've literally been backwards and forwards to London sourcing fabric so many times in recent times, which is rather annoying when my hometown is 30 minutes from London and my uni town is over two hours away! But I've been enjoying choosing my final fabrics and experimenting in them, even if it is burning a hole in my pocket! I've also come across so many gorgeous fabrics that I want to make clothes in for myself when I finish uni - How gorgeous are these tartans?! Pattern cutting day in and day out has also become a part of my daily routine. I recently invested in a pair of fabric scissors which nearly cost me £100... but they're so worth it as they feel like I'm cutting through air, and they'll last me a lifetime! My little floral apple pin holder is from my boyfriend's nanny and I love it! I love treating myself to a fashion magazine or two at the weekend while I do some sketchbook and watch some Breaking Bad! You definitely have to chill out a bit at the weekends otherwise you'll literally go crazy. And last but not least, here is my favourite image to describe the past few months of my life. 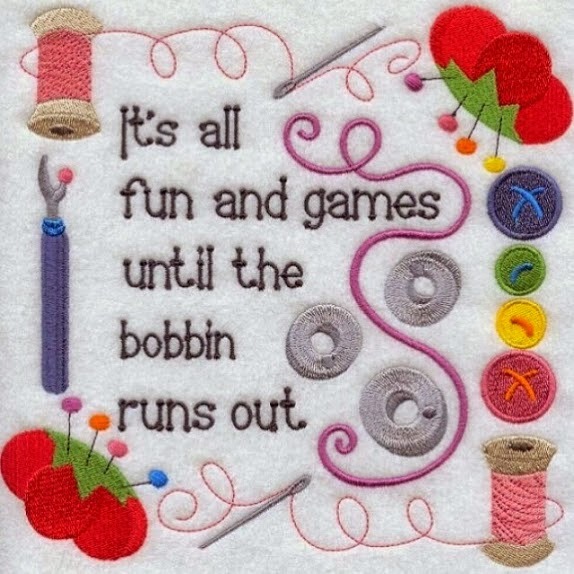 It literally is all fun and games until the bobbin runs out haha! There is nothing worse than sewing a garment and the bobbin running out halfway through, athough I've had it before where it ran out before I even started, and I didn't realise until I'd finished that seam... that was very annoying! I hope you enjoyed a little insight into my life and a slightly different Sunday summary! And you can follow my instagram @floraldanielle for daily updates! I'm not too keen on any of these anymore haha so will definitely post the updated versions in the next blog post! I was literally sewing a sleeve into a bodice the other day when my bobbin ran out! I was so frustrated! I have a hand-in pretty soon so I'm stressing out.. 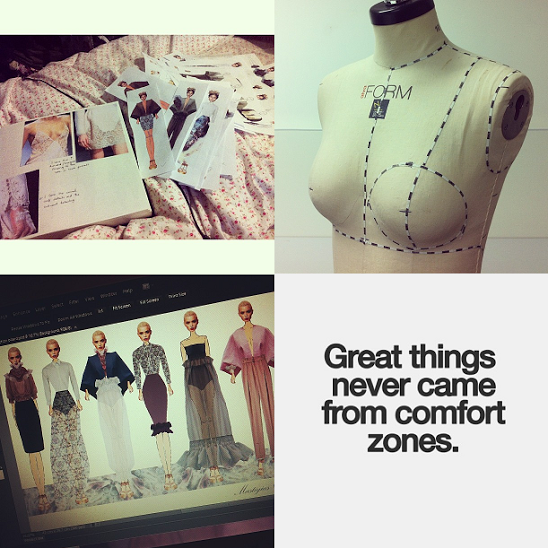 I really liked reading this post, I don't feel so alone as a fashion student! Looking forward to seeing how your collection turns out! Ahh it's so, so frustrating isn't it?! Good luck with your hand-in! My final two terms are merged together so we don't actually have a hand-in until the final one in May, which is kinda more stressful haha! Thank you :) we need a society for fellow fashion students to stress together! I would have loved to have learned how to design and make dresses, I'm so jealous. I'm sure you work very hard but the rewards of satisfaction and achievement must be massive. You are incredibly talented and I can't believe you still have time to write a blog. Yes that's definitely it, it's alot of hard stressful work but it's worth it when you make nice things! Yes it is really hard work but it'll be worth it! 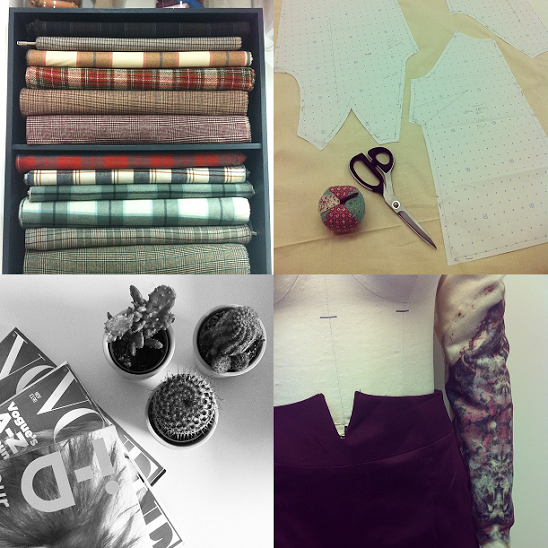 Anyone can learn to sew though so you should definitely do it! I can't think of any in particular but I'll be updating my blog with more fashion student posts so keep an eye out for them! I will definitely post an updated version of my work as it gets going, thank you again for the lovely comments! It's lovely to hear such nice comments on my work! I love reading posts like this because I'd love to study fashion design at uni after my foundation, it all sounds really interesting! I love the top you made with the draped fabric!